Wales clung on to beat Italy 23-19 on a miserable evening in Cardiff that saw both Rhys Webb and Leigh Halfpenny stretchered off. The involvement of both in the Rugby World Cup, which Wales enter here against Uruguay on Sep. 20, looks very much in doubt and gives coach Warren Gatland plenty to ponder. On the pitch the hosts were flat, scoring a try through George North before relying on 15 points from the boot of Halfpenny. Dan Bigger added a late penalty once the full-back had departed. Indeed, Italy scored two tries to Wales' one - through Leonardo Sarto and Guglielmo Palazzani - while Tomasso Allan added two penalties, and Carlo Canna a drop goal. Wales were hoping to sign off on their warm-up campaign with a comfortable and morale-boosting win before the World Cup kicks off in a fortnight. But Italy and their returning skipper had clearly not read the script. There were less than two minutes on the clock when Sergio Parisse picked off a wayward Alex Cuthbert pass and set sail for the line. Man of the match Scott Williams did brilliantly to haul the No.8 down before the line, but reinforcements were slow, Italy recycled the ball and Sarto went over. Allan missed the ensuing conversion, but a successful penalty before the clock struck 10 minutes gave the visitors an eight-point lead. Finding themselves behind, Wales suddenly put an attacking move together with Scott Williams and Webb both making good ground. The hosts kept hold of the ball and narrowed the deficit as a wonderful pass from Williams found North in space, and the wing cantered over. An uncharacteristic miss from the tee by Halfpenny prevented Wales narrowing the gap further. However, after a long break as Webb received treatment for an ankle injury, the full-back did level the scores with three points. Dominic Day's late tackle allowed Allan to restore Italy's lead almost immediately from the restart, and it was an advantage they took into the break. Halfpenny levelled it up with an early second-half penalty, but Wales again struggled to impose themselves on the contest. Two further three-point efforts from the full-back, sandwiched either side of a drop goal for young Azurri replacement Canna, at least gave the hosts a 17-14 lead. 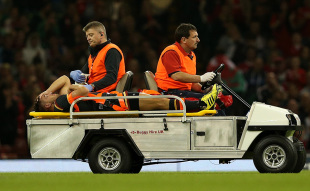 It was an advantage Halfpenny would extend once more before disaster struck and the Toulon man was forced to depart on a stretcher with an oxygen mask strapped to his face. Biggar notched a penalty of his own but a nightmare afternoon was rounded off as Palazzani touched down in the right corner with time over. Canna's missed conversion was met with whistles as a disheartened Welsh public trudged home. ESPN is proud to announce an exclusive 1-hour special - Cheika's Wallabies: Hope of a Nation - premiering on ESPN Weds Sept 9 at 9pm AEST (11pm NZ). ESPNscrum's leading rugby expert Greg Growden goes one-on-on with the Wallabies coach in this exclusive special that gives a rare insight into the intriguing personality of Australia's head coach.